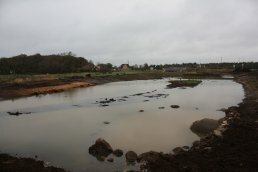 A constructed wetland in the Tønder Municipality will help solve rainwater problems, while enriching the area’s recreational and biological life. In Tønder Municipality, the construction of a new wetland will address future rain and sewage challenges. The upcoming closure of the local wastewater treatment plant in 2024 means that the municipality, in cooperation with the utility company, Tønder Forsyning, will begin to utilize the ecosystem services of a wetland area to filter rainwater from the town and increase flood protection. The area will also serve as a recreational area for citizens to enjoy. The concept is based on imitating the natural purification processes that occur when water passes through streams, lakes and wetlands. When the water level is high in Brede Å, vegetation is only just visible in the wetland which filters rainwater before directing it into the stream. In Denmark, other types of basin solutions have been used to hold back and clean rainwater in urban areas. With trickle meadows or constructed wetlands, which are widely used in the United States, it is possible to create an area rich in biodiversity where people can also come to enjoy nature. In this way, the wetland not only addresses the problem of larger amounts of rainwater in an economically efficient manner, but creates added value for citizens of the municipality. The wetland helps to reduce the risk of infection from waterborne diseases, as the sewage system is designed to separate sewage and rainwater into each of their sewer pipes. The project is located in a field area along the stream. In this area, a raised road doubles as the city’s embankment, helping to reduce the risk of flooding. The wetland both cleans and filters water slowly which then trickles down to the stream Brede Å and into the Wadden Sea, thus helping to protect the marine ecosystem. 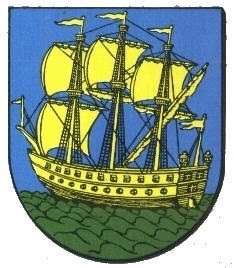 Tønder is a municipality in Region of Southern Denmark on the Jutland peninsula in south Denmark.